Appropriately defining the instability pattern is one of the keys to successful patient outcomes in multidirectional instability of the shoulder. It can be difficult to do, however, because of the variability in presentation. The authors review important findings on clinical evaluation, physical exam, and imaging that suggest multidirectional instability. Multidirectional shoulder instability is a diagnostic and management challenge due to the variability in presentation. [1,2] The classic traumatic unidirectional instability, for example, has a relatively well-defined pattern of disability and shoulder pain in certain glenohumeral positions. In contrast, multidirectional instability is defined as abnormal glenohumeral translation in more than one direction coupled with variable incidence of associated labral and capsular lesions. In addition, multidirectional glenohumeral instability must be differentiated from asymptomatic glenohumeral hyperlaxity and glenohumeral hyperlaxity presenting with unidirectional instability. An important distinguishing characteristic is pain and symptoms affecting activity in the face of multidirectional instability. Physical therapy and functional exercises are important components in the management of multidirectional shoulder instability. When surgery is required, arthroscopic stabilization techniques provide direct visualization of the capsulolabral complex and allow the surgeon to address associated lesions and capsular redundancy. Patients with multidirectional shoulder instability in one shoulder often present with ligamentous laxity in the contralateral shoulder. Surgical management of both shoulders is rarely indicated. Patients presenting with recurrent shoulder instability following a stabilization surgery should be carefully evaluated for the presence of multidirectional instability that may have compromised their previous surgical results. 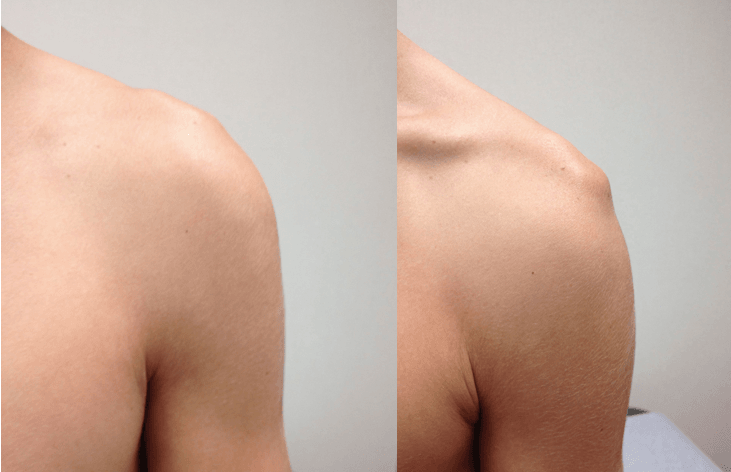 Patients suffering from collagen disorders such as Ehlers-Danlos or Marfan’s syndrome will often present with multidirectional shoulder instability. Ehlers-Danlos and Marfan’s can decrease the efficacy of open and arthroscopic soft-tissue shoulder reconstruction procedures. The presence or absence of generalized ligamentous laxity should be determined by evaluating hyperextension of the elbows, knees, and metacarpophalangeal joints. Following these basic but important components, specific stability tests should be performed to evaluate the stability of the anterior, posterior, and inferior shoulder. Anterior apprehension is assessed with the shoulder in 90 degrees of abduction. The arm is gently externally rotated; a positive test is the patient describing a sense of shoulder dislocation. The relocation test is a posteriorly directed force on the abducted and externally rotated shoulder that reduces the feelings of dislocation produced by the apprehension test. Although most patients with multidirectional instability do not have classic apprehension on examination, the examiner should appreciate the spectrum of glenohumeral instability in each patient with a thorough examination. The sulcus test is performed with the arm in adduction. The arm is pulled inferiorly and the gap formed between the undersurface of the acromion and the superior humeral head is measured. A gap greater than 2 cm is suggestive of multidirectional instability (Figure 1). Figure 1. The sulcus test is performed with the arm in adduction (left). A gap beneath the acromion and apprehension in this patient is suggestive of multidirectional instability (right). Although the sulcus test does not often produce apprehension or pain, these findings may be observed in patients with multidirectional instability. Pain is a common complaint in patients with multidirectional instability, affecting their ability to compete. Involvement of the rotator interval in the patient’s instability pattern is evaluated by performing the sulcus test with the arm in 30 degrees of external rotation. If the sulcus decreases in height the rotator interval is intact and does not need to be addressed surgically. Anteroposterior, scapular outlet, and axillary plain radiographs are performed for initial bony evaluation of the unstable shoulder. Anterior and posterior glenoid bone stock is visualized using the glenoid profile view of Bernageau. Plain radiographs can demonstrate Hill-Sachs lesions or reverse Hill-Sachs lesions and glenoid dysplasia. Positive radiographic findings are more commonly observed in traumatic instability cases. Multidirectional instability is normally associated with a lack of positive radiographic findings. Magnetic resonance imaging (MRI) or MR-arthrography (MRA) can be performed for evaluation of the capsulolabral structures. An MRA is the gold-standard modality for visualization of the labrum and capsule. Filling the glenohumeral joint with contrast allows an appreciation of capsular volume, which is increased in patients with multidirectional instability. Frank labral tears due to significant injury and more subtle labral fraying from repetitive microtrauma can be visualized using an MRA. Imaging is helpful to rule out significant capsulolabral injury and to assess capsular redundancy. Imaging alone, however, is often ineffective at describing the pattern of instability. Physical examination remains the foundation of an appropriate diagnosis to guide treatment. Studies have shown electromyographic differences in muscular firing patterns between normal individuals and patients suffering from multidirectional laxity and instability. These differences indicate that key stabilizing mechanisms likely fail in patients with multidirectional laxity who push their shoulders toward symptomatic multidirectional instability. Burkhead and Rockwood  demonstrated improvement with exercise-based treatment. Nyiri et al  evaluated the effect of physical therapy alone versus physical therapy post-capsular shift. They found that exercise therapy alone was ineffective in returning shoulder kinematics to normal in the face of multidirectional instability. Restoration of muscular kinematics similar to normal subjects occurred in the group treated with physical therapy and surgery. Misamore et al  reviewed 64 patients over a mean 8-year follow-up with multidirectional instability initially managed with rehabilitation. Patients were found more likely to undergo surgery with unilateral involvement, impairment of activities of daily living, and high degrees of laxity. One third of the patients in the study dropped out for surgery within the first 2 years. The study found a poor response to nonoperative management of multidirectional instability in their population of young and athletic patients. Nineteen patients were treated with arthroscopic stabilization by McIntyre et al. At an average follow-up of 34 months, 92% returned to previous competition level. A group of 43 athletic patients with multidirectional instability were treated with arthroscopic stabilization by Baker et al. Eighty-six percent of their patients were able to return to athletics with little or no limitation (Figure 2). Figure 2. A 17-year-old patient with bilateral glenohumeral joint laxity presented with pain and feelings of instability. Load and shift, sulcus, and jerk tests were positive. Findings at arthroscopy: Anterior capsulolabral lesion (top left), inferior lesion (middle left), and posterior capsulolabral lesion with capsular redundancy (bottom left). Systematic arthroscopic repair of the lesions: anterior (top right), inferior (middle right), and posterior (bottom right). The appropriate treatment of multidirectional shoulder instability hinges on a thorough physical examination and understanding of the pattern of glenohumeral laxity. Multidirectional glenohumeral instability should be distinguished from asymptomatic glenohumeral hyperlaxity and glenohumeral hyperlaxity presenting with unidirectional instability. MRA is the gold-standard imaging modality for multidirectional instability. Large lesions and subtle lesions can be evaluated prior to surgery to direct operative planning.Operative management of multidirectional instability should not be undertaken in the absence of a lesion on MRA without an exhaustive trial of physical therapy. Arthroscopic capsular plication and labral repair is our preferred surgical treatment. Arthroscopy allows visualization of the entire joint, the entire capsule, and all associated lesions producing the instability. Additionally, arthroscopy allows the operator to move the shoulder through range of motion while evaluating glenohumeral stability dynamically. Labral detachment or tearing from the glenoid is managed with suture anchor fixation to the glenoid in our practice. Isolated simple capsular redundancy is treated with capsular imbrication. Patulous capsules requiring imbrication with concomitant labral tears are treated with capsular shift and labral repair using suture anchor fixation. Superior labral tears associated with instability are treated with repair in patients younger than age 40. Patients older than age 40 are treated with concomitant long head of the biceps tenodesis. Postoperative physical therapy is a key component of successfully returning normal shoulder kinematics following operative stabilization. Multidirectional shoulder instability is a multifaceted problem encompassing atraumatic and traumatic etiologies. Pain with overhead activity, decreased endurance, and weakness is often the presenting complaint. These shoulders should be carefully examined, and MRA should be used to assist in delineating underlying lesions. Appropriate and successful navigation of multidirectional instability requires an appropriate understanding that the instability stems from more than one lesion and requires an ability to work in the anterior, inferior, and posterior glenohumeral joint. Arthroscopic management is the current standard, but it is difficult to perform well. Open surgery should be considered if a surgeon has little arthroscopic experience or in the face of previous failed stabilization procedures. Matthew D. Williams, MD, is an orthopaedic surgeon with Louisiana Orthopaedic Specialists, Lafayette, Louisiana. T. Bradley Edwards, MD, is an orthopaedic surgeon with Fondren Orthopedic Group and Texas Orthopedic Hospital, Houston, Texas. Neer CS, Foster CR. Inferior capsular shift for involuntary inferior and multidirectional instability of the shoulder. A preliminary report. J Bone Joint Surg Am. 1980 Sep;62(6):897-908. Gartsman GM, Roddey TS, Hammerman SM. Arthroscopic treatment of multidirectional glenohumeral instability: 2 to 5 year follow-up. Arthroscopy. 2001 Mar;17(3):236-243. Turkel SJ, Panio MW, Marshall JL, Girgis FG. Stabilizing mechanisms preventing anterior dislocation of the glenohumeral joint. J Bone Joint Surg Am. 1981 Oct;63(8):1208-1217. Rowe CR, Zarins B. Recurrent transient subluxation of the shoulder. J Bone Joint Surg Am. 1981 Jul;63(6):863-872. Burkhead WZ, Rockwood CA. Treatment of instability of the shoulder with an exercise program. J Bone Joint Surg Am. 1992 Jul;74(6)890-896. Baker CL III, Mascarenhas R, Kline AJ, Chhabra A, Pombo MW, Bradley JP. Arthroscopic treatment of multidirectional shoulder instability in athletes: A retrospective analysis of 2 to 5 year clinical outcomes. Am J Sports Med. 2009 Sep;37(9):1712-1720. O’Connell PW, Nuber GW, Mileski RA, Lautenshlager E. The contribution of the glenohumeral ligaments to anterior stability of the shoulder joint. Am J Sports Med. 1990 Nov;18(6):597-584. Blasier RB, Soslowsky LJ, Malicky DM, Palmer ML. Posterior glenohumeral subluxation: Active and passive stabilization in a mechanical model. J Bone Joint Surg Am. 1997 Mar;79(3):433-440. Kim SH, Park JS, Jeong WK, Shin SK. The kim test: A novel test for posteroinferior labral lesion of the shoulder – a comparison to the jerk test. Am J Sports Med. 2005 Aug;33(8):1188-1192. Gagey OJ, Gagey N. The hyperabduction test. J Bone Joint Surg Br. 2001 Jan;83(1):69-74. Bernageau J, Patte D, Debeyre J, Ferrane J. Value ot the glenoid profil in recurent luxations of the shoulder. Rev Chir Orthop Reparatrice Appar Mot. 1976;62(2 suppl):142-147. Morris AD, Kemp GJ, Frostick DM. Shoulder electromyography in multidirectional instability. J Shoulder and Elbow Surg. 2004 Jan;13(1):24-29. Warby SA, Pizzari T, Ford JJ, Hahne AJ, Watson L. The effect of exercise-based management for multidirectional instability of the glenohumeral joint: a systematic review. J Shoulder and Elbow Surg. 2014 Jan;23(1):128-142. Nyiri P, Illyes A, Kiss R, Kiss J. Intermediate biomechanical analysis of the effect of physiotherapy only compared with capsular shift and physiotherapy in multidirectional shoulder instablity. J Shoulder Elbow Surg. 2010 Sep;19(6):802-813. Misamore GW, Sallay PI, Didelot W. A longitudinal study of patients with multidirectional instability of the shoulder with seven to ten year follow-up. J Shoulder Elbow Surg. 2005 Sep;14(5):466-470. Bois AJ, Wirth MA. Revision open capsular shift for atraumatic and multidirectional instability of the shoulder. J Bone Joint Surg Am. 2012 Apr;94(8):748-756. Jacobson ME, Riggenbach M, Wooldridge AN, Bishop JY. 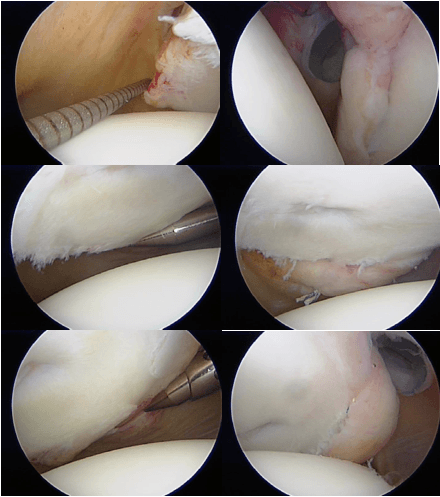 Open capsular shift and arthroscopic capsular plication for treatment of multidirectional instability. Arthroscopy. 2012 Jul;28(7):1010-1017. McIntyre LF, Caspari RB, Savoie FH 3rd. The arthroscopic treatment of multidirectional shoulder instability: two-year results of a multiple suture technique. Arthroscopy. 1997 Aug;13(4):418-425. Previous articlePartial Radical Debridement: Heresy, or Cautiously Optimistic?